This Sportsman L, with a top mounted non-coupled light meter (presumably the origins of the 'L' designation) and Prontor 300 shutter, was purchased in the UK but was probably never marketed in the UK. 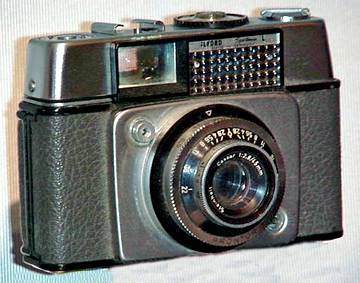 It is believed to be one of a range of Ilford Sportsman cameras only sold on the continent, especially in Holland. 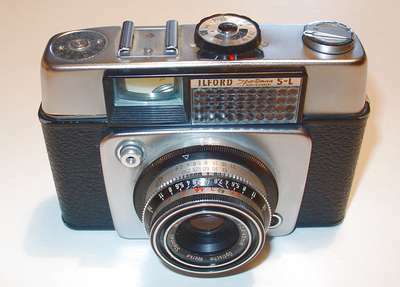 There was also a Sportsman S-L (see below), the same as the Sportsman L but with the advantage of a built-in self-timer. Note the grey leatherette covering, rather than black, a colour scheme which was considered less suited to the more formal British taste. The grey covering seems to have faired rather better than the more common black. It is still firmly adhering all round, rather than lifting at the edges, as commonly happens with Sportsman cameras. The left hand camera above has a lens marked Steinheil München Cassar, while the right hand version just says Steinheil Cassar. 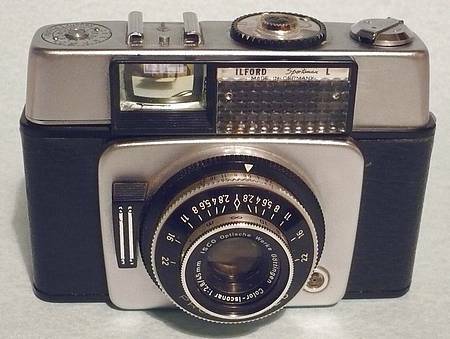 The name 'ILFORD Sportsman L' is less obvious than on most of the Sportsman range, being relegated to small type face immediately above the selenium cell exposure meter window. Interestingly, it also says "MADE IN GERMANY" rather than the more usual "MADE IN WESTERN GERMANY" (all Sportsman cameras date from a time when Germany was divided, post-WW2, into East and West Germany). Another Sportsman L, this one purchased from the Italian ebay site, covered in black leatherette rather than grey. Picture courtesy of David Muggleton. It is mechanically and optically different from the ones illustrated above. It is has the Prontor 125 shutter rather than the Prontor 300 and the shutter release is a vertical slide instead of a push button. The lens is a Color-Isconar rather than a Cassar. The internal moulding behind the cassette compartment is ribbed rather than plain. The top mounted exposure meter provided an exposure reading that had to be manually transferred to the camera's aperture scale (f2.8 to f22) and shutter speed scale (1/30th to 1/125th or 1/300th sec, depending upon which shutter is fitted). The Prontor 125 was a self-cocking shutter whereas the Prontor 300, as fitted to this Sportsman-L with an additional 1/300th sec speed (see here), was a conventional type, cocked by the action of the wind on lever (situated below the top plate as on all Style 3 and Style 4 Sportsman cameras). The base plate shows a self-resetting exposure counter, similar to that which appeared on the Prontor 125 model in 1963. The film rewind crank is also the same as on the Prontor 125 model, with its conventional fold over crank and its chamfered edges. The method of opening the back is the slide up type, using the thumb nail to lift the top latch. This is again similar to the opener style that evolved by the time of the Sportsman Prontor 125 in 1963, except that the Prontor 125 model had a leatherette insert covering the bright metal strip. See the various types here. The film type reminder dial, on the LHS of the top plate (camera viwed from the front) shows continental markings instead of the names of Ilford films available at the time. This further suggests that the camera was not meant for sale in the UK. Many variations of Dacora manufactured, Ilford badged, Sportsman cameras were sold just in mainland Europe, with Holland being, apparently, a major market area. My thanks to Juha Juntunen in Finland for the pictures and information on this page relating to a model called the Sportsman S-L. The Sportsman S-L is not thought to have ever been sold in the UK. 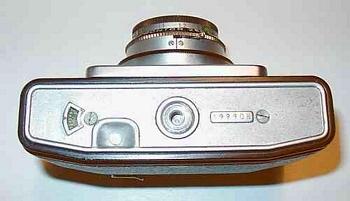 The Sportsman S-L was similar to the Sportsman L, see above, but with the benefit of a self-timer. Juha tells me he has often looked out for old cameras while browsing flea markets in Finland but doesn't remember ever seeing any Ilford cameras. Thus, based upon his experience, Ilford cameras must be pretty rare in Finland. So how did this camera end up there? Juha only recalls that his father obtained this camera as a part of an auction lot that he won in the early 1980s. The camera has manually selectable shutter speeds of 1/30, 1/60, 1/125, 1/250 sec and B (a Prontor 250 S flash synchronised shutter), plus a self-timer. The selectable lens aperture range is f2.8 - f22, and the selector ring moves freely without any specific 'click' aperture stops, although the common aperture positions (22, 16, 11, 8, 5.6, 4, 2.8) are marked. The closest focusing distance is 1 metre, and distances are marked only in metres. The lens is a Steinheil Cassar (Optische Werke Steinheil Munchen) f2.8, 45mm focal length. The camera seems to be fully manual in operation; there is no "auto" setting. The selenium cell light meter is built into the camera's top cap and operates using the 'matching needle' principle. A manually positioned needle is made to coincide with the position of the needle moving under the influence of the selenium cell. The user then reads off various combinations of shutter speed and aperture that correspond to the correct exposure for the set film speed (ASA and DIN). The bright line viewfinder contains no information about exposure or any camera settings. This form of automation is less sophisticated than the semi-automatic operation provide by the Sportsman Auto. 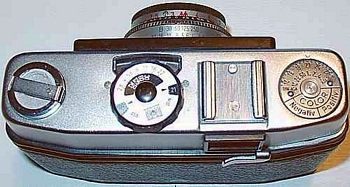 The exposure counter is located on the underside of the camera, as with the 1963 Sportsman Prontor 125, the Sportsman L (see above) and the updated version of the Sportsmaster. I understand from Andy Holliman that the Sportsman S-L was also sold with a Prontor 300 S-E shutter. Andy's Sportsman S-L has a non-coupled Bertram exposure meter (the one on the camera shown here is probably also of Bertram manufacture).